Posted Jan 21, 2018 by Eds. On its deadly run through the Caribbean last September, Hurricane Irma lashed northern Cuba, inundating coastal settlements and scouring away vegetation. 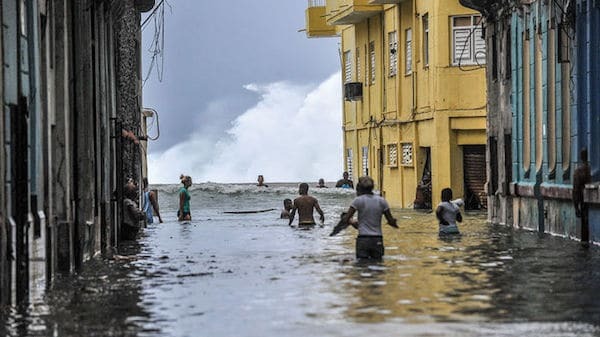 The powerful storm dealt Havana only a glancing blow; even so, 10-meter waves pummeled El Malecón, the city’s seaside promenade, and ravaged stately but decrepit buildings in the capital’s historic district. “There was great destruction,” says Dalia Salabarría Fernández, a marine biologist here at the National Center for Protected Areas (CNAP). As the flood waters receded, she says, “Cuba learned a very important lesson.” With thousands of kilometers of low-lying coast and a location right in the path of Caribbean hurricanes, which many believe are intensifying because of climate change, the island nation must act fast to gird against future disasters. But the cash-strapped government had made little headway. Now, “Irma [has] indicated to everybody that we need to implement Tarea Vida in a much more rapid way,” says Orlando Rey Santos, head of the environment division at Cuba’s Ministry of Science, Technology, and Environment (CITMA) here, which is spearheading the project. The government aims to spend at least $40 million on Project Life this year, and it has approached overseas donors for help. Italy was the first to respond, pledging $3.4 million to the initiative in November 2017. A team of Cuban experts has just finished drafting a $100 million proposal that the government plans to submit early this year to the Global Climate Fund, an international financing mechanism set up under the United Nations Framework Convention on Climate Change. Rising sea levels pose the most daunting challenge for Cuba. Over the past half-century, CITMA says, average sea levels have risen some 7 centimeters, wiping out low-lying beaches and threatening marsh vegetation, especially along Cuba’s southern midsection. The coastal erosion is “already much worse than anyone expected,” Salabarría Fernández says. Storms drive the rising seas farther inland, contaminating coastal aquifers and croplands. Still worse is in store, even in conservative scenarios of sea-level rise, which forecast an 85-centimeter increase by 2100. According to the latest CITMA forecast, seawater incursion will contaminate nearly 24,000 square kilometers of land this century. About 20% of that land could become submerged. “That means several percent of Cuban land will be underwater,” says Armando Rodríguez Batista, director of science, technology, and innovation at CITMA. To shore up the coastlines, Project Life aims to restore mangroves, which constitute about a quarter of Cuba’s forest cover. “They are the first line of defense for coastal communities. But so many mangroves are dying now,” Salabarría Fernández says. Leaf loss from hurricane-force winds, erosion, spikes in salinity, and nutrient imbalances could all be driving the die-off, she says. Coral reefs can also buffer storms. A Cuban-U.S. expedition that circumnavigated the island last spring found that many reefs are in excellent health, says Juliett González Méndez, a marine ecologist with CNAP. But at a handful of hot spots, reefs exposed to industrial effluents are ailing, she says. One Project Life target is to squelch runoff and restore those reefs. Another pressing need is coastal engineering. Topping Cuba’s wish list are jetties or other wave-disrupting structures for protecting not only the iconic Malecón, but also beaches and scores of tiny keys frequented by tourists whose spending is a lifeline for many Cubans. Cuba has appealed to the Netherlands to lend its expertise in coastal engineering. Perhaps the thorniest element of Project Life is a plan to relocate low-lying villages. As the sea invades, “some communities will disappear,” Salabarría Fernández says. The first relocations under the initiative took place in October 2017, when some 40 families in Palmarito, a fishing village in central Cuba, were moved inland.